There are some old favorites, such as Tosca in which the music, characters, and/or the plot are so complex that a skilled director can bring a new insight to the most jaded opera lover. 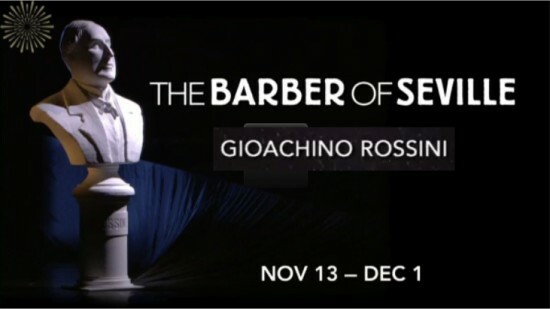 Rossini’s The Barber of Seville is not one of these. Rather, its music is so basic, its characters so stock, and its plot so simple that a director can put almost anything on stage without creating any blatant inconsistencies. 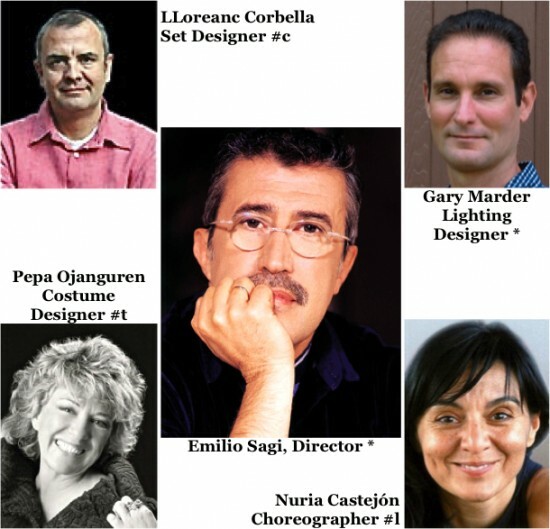 Emilio Sagi and his design team created outstanding visual effects in the staging. 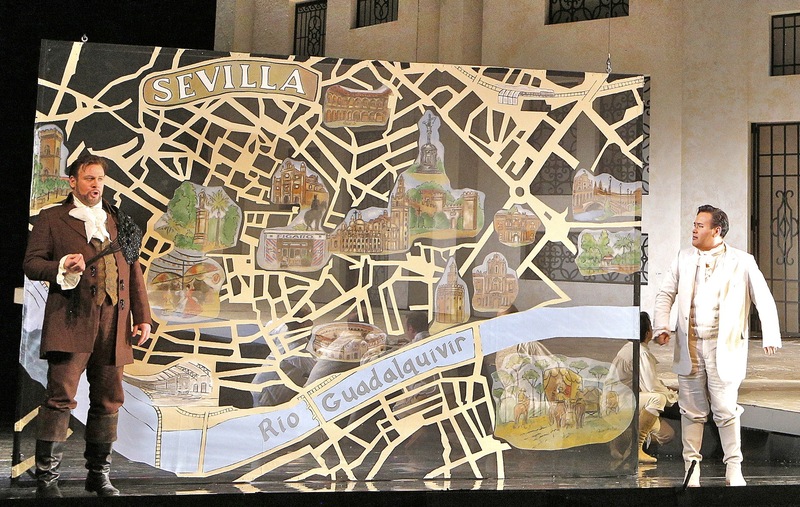 For example, early in Act I Figaro (Lucas Meachem) is telling Count Almaviva (Javier Camarena) how he can find his shop. A large scale city map suddenly appears, and as he is giving directions in rapid Italian, he is also tracing out the route with his finger. I had seen Lucas Meachem in San Francisco 2 years ago when he sang the title role in Don Giovanni. He has an imposing build and a strong baritone voice. 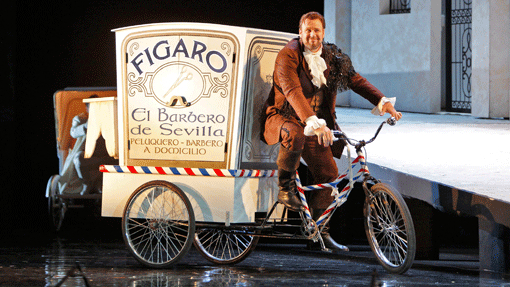 Figaro often tends to dominate the action whenever he is on stage – Meachem played him more as a team player, which enhanced the overall unity of the production. Javier Camarena (Count Almaviva) had a magnificent tenor voice and played all of disguises well. 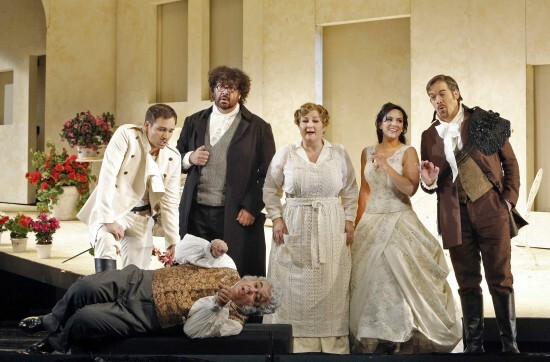 Throughout most of the opera he is disguised (except to the audience and to Figaro who goes along with the deception) as a penniless student Lindoro. 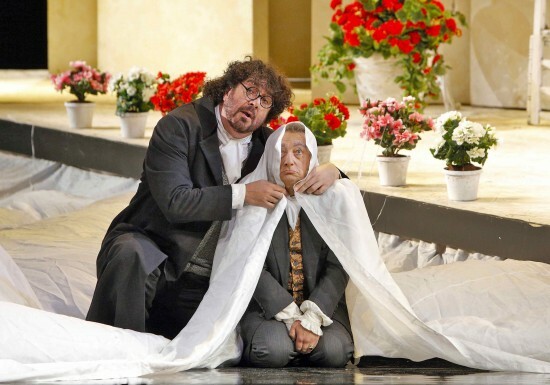 In his efforts to see his beloved Rosina under the very eyes of her guardian Dr. Bartolo, Almaviva disguises himself as a drunken soldier in Act I, and as a music teacher Don Alonso in Act II. Rosina was sung by Isobel Leonard as her SFOpera debut. However she has already been seen in major opera houses all over Europe and the United States, including the lead role of Miranda in Thomas Adès’ The Tempest at the Met last year. I’m glad she finally came to San Francisco and that I was there to witness it. In addition to being a joy to listen to, she is a delight to look at, whether live from Row R or close up in a picture. She and Camarena were well-matched in their duets. Completing the quartet of stars in the four major roles is Alessandro Corbelli as Rosina’s guardian, Dr. Bartolo. Like the other three, he has performed in Europe and the USA, including the Met. 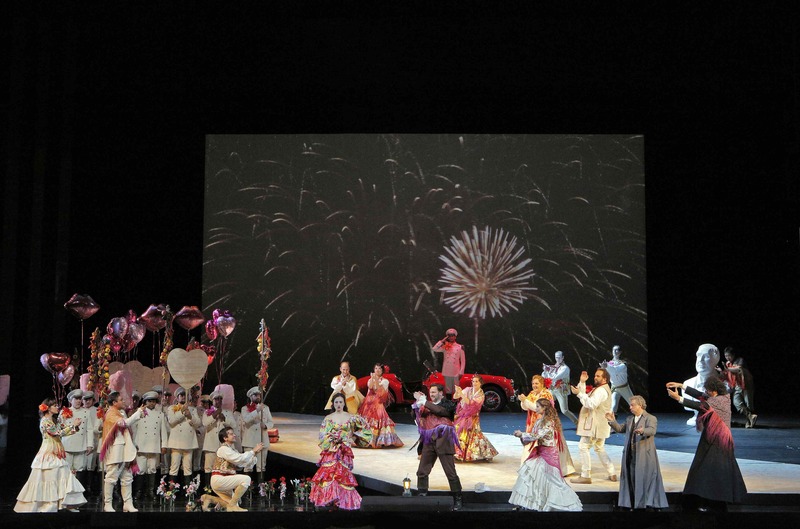 This is his second appearance here – he debuted as Dr. Dulcamara in L’Elisir d’Amore 5 years ago. His resonant bass-baritone voice is matched by his comic acting ability. A short man, he struts fussily about the stage producing smiles and chuckles in the audience, rather than belly laughs. At one point I thought he needed only a cocked hat to be a parody of Napoleon. 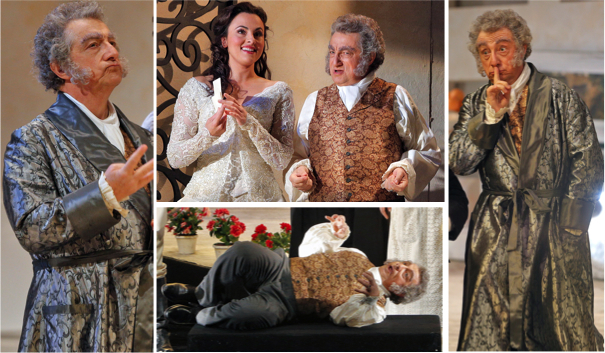 I should mention that SFOpera has double-cast the opera’s four principal roles in alternating performances – aside from the above picture, this review is concerned solely with the opening-night cast in both words and pictures. Catherine Cook is no stranger to SFOpera audiences, having appeared in more than forty roles since her debut 22 years ago. She is a graduate of the Merola Opera Program and a former Adler Fellow. Earlier this fall she took over the title role from Patricia Racette for the last few performances of Dolores Claiborne. Under the direction of Emilio Sagi, she has created a different and more sympathetic character for the servant Berta. In other productions, the servant is portrayed as a buffoon and/or a hag – as a flunky who stupidly carries out her master’s orders. Cook plays her as an intelligent employee with a lively interest in the affairs of the family – and someone who sympathizes with Rosina in her rebellion. Often, when not actively present in the scene, she can be seen perched comfortably on an upstairs window seat, quietly observing the goings-on. Near the end of Act II Berta has her own little aria in which she gives her opinion that love is a universal evil but “I also feel it.” Nothing in the libretto indicates the identity of the recipient of her amorous feelings, but I infer the obvious – Berta believes that “she”, rather than the teen-age Rosina, would be a suitable match for her rich old employer. Usually she is alone on stage, sings her aria, and exits as the storm-music begins – a ridiculous, pathetic old woman. However, in this production the male servant Ambrogio (A. J. Glueckert), is silently wooing her. She ignores him while singing, but at the end of her song she turns to the audience with a little smile and a wry shrug of her shoulders, as if to say, “What the hell, Bartolo is a pipe-dream, but this guy is here and now.” – and trips off stage in Ambrogio’s arms. the happy couple rides off into the sunset in their bright red 1958 Jaguar XK-SS convertible. Lots of performances left in November. Come see for yourself. This review by Philip G Hodge appeared in sanfranciscosplash.com on November 17, 2013. 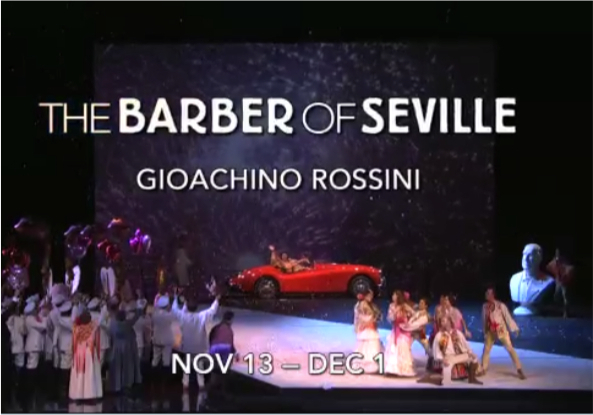 This entry was posted in Opera Review and tagged Barber of Seville, Rossini, San Francisco Opera. Bookmark the permalink.